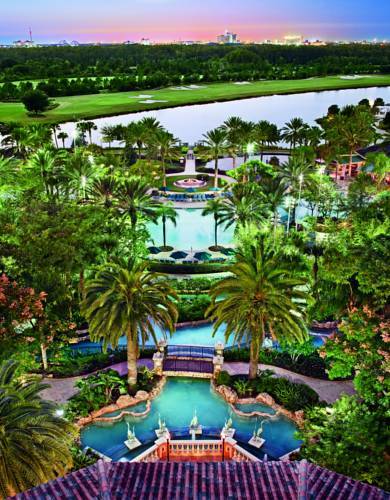 Treat yourself to the getaway of a lifetime at JW Marriott Orlando, Grande Lakes. Situated on 500 meticulously manicured acres, our luxury resort offers shuttle service to Walt Disney World , SeaWorld and Universal Orlando , so you can explore the area without having to worry about expensive rental cars and parking fees. After a day full of adventure, enjoy a memorable meal at one of our seven renowned restaurants serving everything from upscale Italian to authentic sushi to farm-to-table American cuisine. Play a challenging round of golf on our beautiful 18-hole course, or indulge in a massage or facial at our award-winning three-story spa. Gather with friends, family members or colleagues in one of our 46 sophisticated event venues, then retreat to luxurious guest rooms boasting plush bedding, LCD TVs, elegant marble bathrooms and inspiring views of the lush Florida scenery. Book an unforgettable stay at JW Marriott Orlando, Grande Lakes today for a once-in-a-lifetime trip. Using ingredients from our onsite organic garden, our signature restaurant, under the direction of Chef Melissa Kelly, delivers a fine dining experience that successfully marries traditional Italian flavors with a very modern sensibility. Open for breakfast; this hotel restaurant looks to American classics for its inspiration; fresh-baked breads and pastries complement the breakfast menu. A desire to bring our on-site farm experience to guests brought Whisper Creek Farm: The Kitchen to life. The restaurant features farm inspired comfort food and craft beers. Sample menu items include flatbreads, small sandwiches, snacks and small plates. Sip a hand-crafted cocktail or a New World wine at our casually trendy lounge. The Sushi Bar offers a raw bar and an a la carte selection of Asian tapas. Casual cuisine and tropical beverages are the focus at Quench, where swim attire is encouraged and guests soak in the Orlando sun while dining on salads and burgers. In a rush? Our eco-friendly caf is a laid-back alternative to fine dining, with its range of healthy, grab-and-go sandwiches and snacks. Located right within the hotel, Starbucks delivers all your favorite gourmet coffees, lattes, and pastries in a cozy coffee house setting.